Amazon Fire HD 8 is considered as one of the current cheapest tablets which are produced by a recognisable brand. It packs in low-end technologies that are sufficient to meet the needs of average buyers. Display: 8 inches 1280 x 800 LCD with 189 pixels per inch. Camera: 2MP rear camera and 0.3MP front-facing camera. Connectivity: Dual-band Wi-fi support, Bluetooth, Ports: USB 2.0, 3.5mm stereo jack. 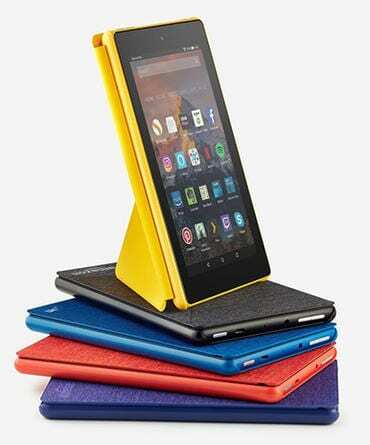 Amazon Fire HD 8 is a plastic sheltered tablet available in varying colours ( Red, Yellow, Blue, Black). It has an adequate size to hold in the hands, but it is a bit heavy for continuous reading section. The plastic shell is not designed to be water resistant or rugged but can simply withstand average drops and hits. It comes with Amazon Fire OS is an Android-based operating system with a different interface and comes with peculiar applications from Amazon app store. There is no fingerprint scanner. Its micro SD card slot supports cards up to 256GB, allowing much space for media files like laptops. Amazon Fire HD 8 4,750mAh battery can last for 12 hours. Charging its battery takes a long time about 6hrs. It is capable of running more graphics intensive games and does not have Google Play Store, but just the Amazon App Store. It has Alexia built-in that works with voice recognition like the windows 10 Cortana but doesn’t respond to voice recognition, so you have to push the Home button to activate its services. With its adequate processor and RAM, it provides enough speed for your media usage. This tablet is designed to be used in landscape mode for viewing movies, so the controls make sense. Amazon Fire HD 8 has stereo speakers mounted on the sides and tuned with Dolby audio, the tablet produces a good amount of sound and is effective for watching videos/ playing music. Amazon Fire HD 8 cameras have poor outputting, shaky, grainy, blurry and dull shots. The image colours it produces makes human skin look sickly, and taking selfies with the front camera can be slightly inconvenient as it readily zooms in. Its price starts from £80 with special offers with this model that has a 16GB storage while the 32GB storage starts at £100 and in Nigeria the price is about #32,780 for the 16GB storage while the 32GB storage starts at #48,100 depending on exchange rates.